Ranking on the internet is no small talk. On the daily basis, millions of blog post are published, competing. You might be thinking about SEO tools that help you to manage all the rankings and track them as closely as possible. It doesn’t matter if you are a regular blogger, SEO expert or an enthusiast; Pro Rank Tracker can be your next SEO tool. Pro Rank Tracker is simple, intuitive and powerful ranking tool. Using Pro Rank Tracker can help you gain the necessary traction that you might have been needed for keyword tracking. There are many tools out there that do the same job, but Pro Rank Tracker does add more features on the table. Pro Rank Tracker not only help you to track keywords, but the service extends to unlimited URLs tracking as well. If you are like me, you will first try the free version of the tool to find out whether it fits your need or not. The free version of the tool offers 2 URL tracking with support for 20 keywords. For starters that a lot! 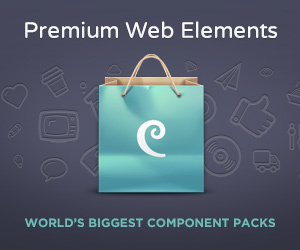 And, if you are just running a single website, you might find the free version up to your needs. It should also be noted that the tracker works across different search engine and is cloud based. Their feature set is rich. Let’s go through the feature list. Super Algorithm And Daily Updates: The pro rank tracker algorithm keeps track of all keywords with high accuracy. It also updates on the daily purpose. Web Based Tracking: The solution is web based. It is hosted on the cloud, and this means that you can work with the tool from anywhere, without worrying about compatibility or portability issues. Diversified Search Engine Coverage: The tool is not confined to only Google, but it expands over 187 local Google Sites, 32 local Bing sites and 35 Yahoo Sites. Local Keyword Tracking Refined: Due to extensive search engine coverage, the tool is one of the best regarding local keyword tracking. Apart from the fantastic features, Pro Rank Tracker offers an extremely powerful and easy to use dashboard. User experience is an important part. No one wants to use a software/tool that doesn’t provide a good user experience. Pro Rank Tracker does provide one of the best user experience. You can check how the dashboard looks by checking the image below. As you can see, the panel shows the URLs, the terms used for tracking and their relevant changes for the period of 24 hours, seven days, and 30 days. It also shows a pie chart and the ratings according to the top 1, 3, 10, 20, and 100 positions. You might also have noticed the dashboard menu on the left. The menu is well laid out and provides an eagle eye view of what’s available in the tool. As you can see, the menu is divided into four major components. Contains Dashboard, URL view, Term view, and list view as the sub menu components. It provides keyword information regarding URL, view and list. The report is a significant part of the tool. There are many different reports that you can generate using the tools. You can also share reports by using the shared reports button. You can generate progress reports, comparison reports, benchmark reports based on the available metrics such as time, URL or keyword. Report generation is cool and can be done with just one click. Reports also let you understand your SEO campaign better. This section is very useful for SEO experts who need to send the update to their clients regularly. You can also schedule the reports to be generated and forwarded to the client after a certain period. Overall, report generation is one of the best feature and striking aspect of the tool. The URLs and terms the section of the tool where you can use it to add URLs and keywords to be tracked. Adding URL and keyword is easy and can be done in a very professional way. You can also add regarding desktop, mobile or local finder. The tool also comes with bulk add option that lets you add a lot of URLs to the tool. For adding bulk URLs or keywords, you need to upload an XLSX file. Our next section is settings. Settings contain all the options to fiddle. For example; you can select the default search engine, report generation options, etc. The tool section contains more features set. For example, you can check out the ranking discovery tool that finds the keywords associated with the URL you added. 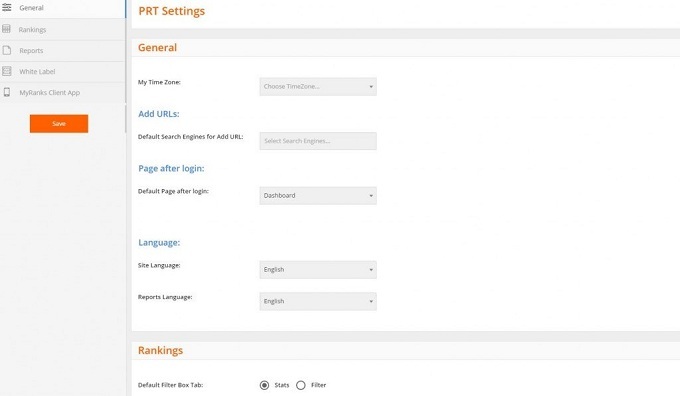 It also includes keyword suggestions and other apps and plugins supported by the Pro Rank Tracker service. Account Usage is the last section of the dashboard menu. It is a statistical section. You can get an overview of how many URLs or keywords you are using. The section is useful when it comes to upgrading your account. When it comes to pricing, Pro Rank Tracker is one of the best-priced solution out there. It is well suited for anyone who has begun his online journey. Enterprise level plans take care of the enterprise level needs. The pricing is divided into five plans. They are as follows. All the plans are useful and is rightly designed for the targeted audience. 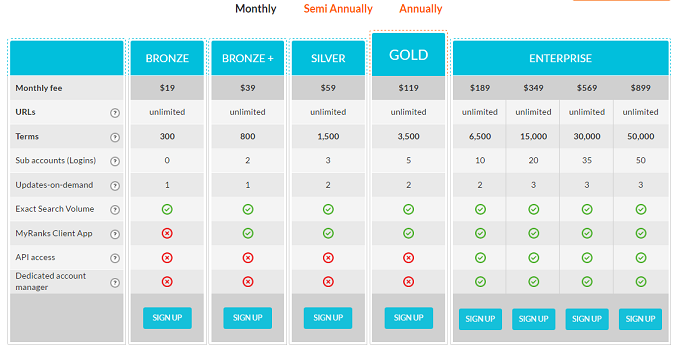 If you found free version too limiting, you can try the bronze plan which is just $15 per month. Affordable indeed! Check the screenshot to understand what each plan offers. Sign up to the free trial to test drive ProRankTracker before upgrading. You can try these Pro Rank Tracker coupon codes during checkout process to save your money. I found Pro Rank Tracker an excellent SEO tool for tracking keywords. The tool can be useful for SEO experts, bloggers or anyone who want to keep an eye on the keywords with 100% accuracy. The main reason many of the business lose their ranking is the fact that they forget to take counter-measures when they start losing rankings. The tool can quickly help them keep a close eye on the primary keywords and try to outrank others whenever needed. If you found the review useful, don’t forget to comment and share!